Who doesn't love a Crock-Pot? 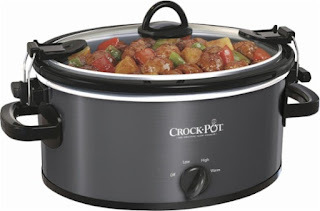 Right now this Crock-Pot® - Cook and Carry 5-Quart Slow Cooker is ONLY $17.49 (Retail $34.99). Enjoy the convenience and portability of this Crock-Pot Cook &amp;amp; Carry slow cooker. The lid-mounted locking system provides a tight seal that prevents leaks and spills while on the go. Slow cook on high or low with this Crock-Pot Cook &amp;amp; Carry slow cooker and then keep food warm until it's ready to serve.